911TruthNow, a non-partisan, So. Oregon grassroots organization, invites you to the So. 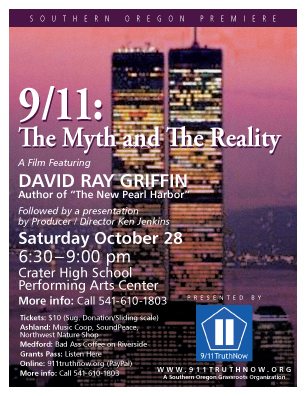 Oregon Premiere of David Ray Griffin's latest film entitled: "9/11 The Myth & The Reality". David Ray Griffin, author of four books about 9/11, including "The New Pearl Harbor", and 30 additional books and 150 articles, is Emeritus Professor of Philosophy of Religion and Theology at the Claremont School of Theology. Filmed live in March and April 2006 during two standing-room only presentations, Dr. Griffin explains how the official story of 9/11 was set up as an unassailable sacred myth. He then explores nine commonly held myths about 9/11, and shows why each must be false. The screening is followed by a presentation by the film's producer and director, Ken Jenkins, who will also respond to questions from the audience. DVDs, refreshments will be available for sale. Doors Open at 6pm, film begins at 6:30pm. Film runtime 1hr 40min.